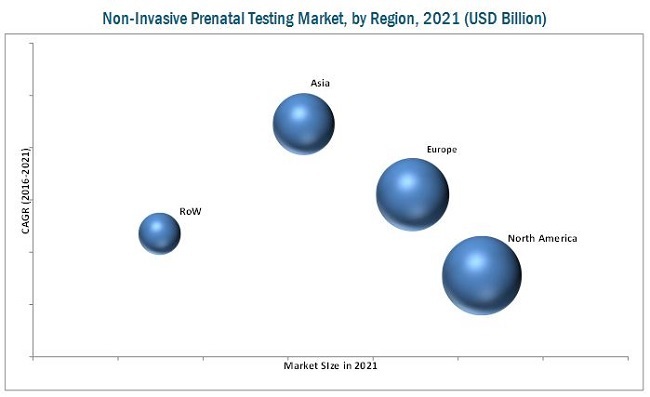 The global Non Invasive Prenatal Testing market is expected to reach USD 2.88 Billion by 2021 from USD 1.35 Billion in 2016, at a CAGR of 16.4% during the forecast period. The NIPT market is segmented based on product, method, application, end user, and region. Based on region, the NIPT market is segmented into North America, Europe, Asia, and the Rest of the World (RoW). North America is further subsegmented into the U.S. and Canada; while Europe is further subsegmented into Germany, France, the U.K. and Rest of Europe (RoE). In 2016, North America dominated the market, followed by Europe. Factors such as high risk of chromosomal disorders with increasing maternal age and rising government investments are driving the growth of the NIPT market in this region. However, Asia is poised to be the fastest-growing region during the forecast period. The major factors driving the growth of this market are improving healthcare infrastructure, growing per capita income, and increasing awareness programs. Based on method, the market is classified into ultrasound detection, biochemical screening tests, fetal cells in maternal blood tests, and cell-free DNA in maternal plasma tests. In 2016, the ultrasound detection accounted for the largest share of the market. The cell-free DNA in maternal plasma tests segment is expected to grow at the highest CAGR during the forecast period. The increasing demand for cf-DNA based techniques in NIPT testing and rising government initiatives to provide prenatal services are the factors contributing to the growth of this market. Based on end user, the NIPT market is segmented into diagnostic laboratories and hospitals. In 2016, the diagnostic laboratories segment accounted for the largest share of the market. Growth in this end-user segment can be attributed to the rising incidence of chromosomal abnormalities and initiatives by companies to provide technologically advanced products to diagnostic laboratories.